The acronym MARGO is short for "Multiproxy Approach for the Reconstruction of the Glacial Ocean surface". It stands in for an international community effort of more than 50 scientists, who pursued the goal to reconstruct the sea-surface temperature at the Last Glacial Maximum with the best methods that are available today: methods that are based on species composition of micro fossils, and geochemical methods. 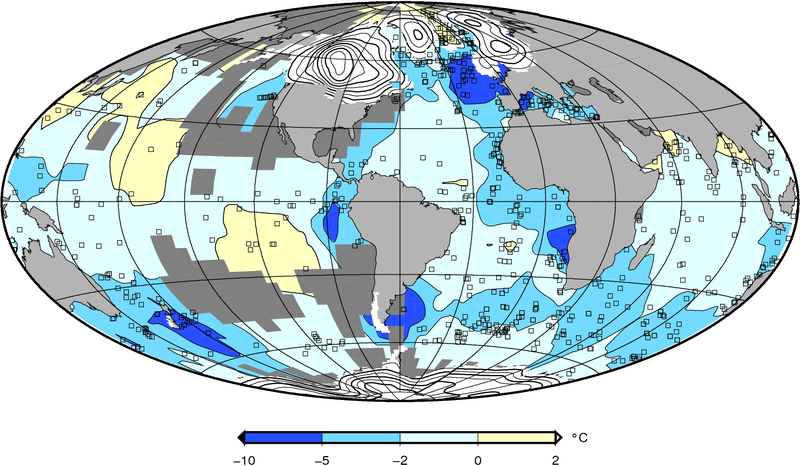 This map shows the reconstructed LGM sea-surface temperature anomaly, computed as the difference between the Last Glacial Maximum (LGM, between 19,000 and 23,000 years before present) and present day, in units of °C for the Northern Hemisphere winter season (January-February-March). Negative anomalies (blue) denote regions that according to the MARGO reconstruction were colder than today, positive anomalies (yellow) point to regions that might have been warmer than today. The squares mark the geographic locations of the sediment cores that were investigated by the MARGO project using a variety of methods for temperature reconstruction. Dark grey areas in the ocean stand in for those regions to which no anomaly could be assigned because the nearest data points were too far (more than 2000 km) away. For illustration, contour lines on land (height contours with a 500 m interval) indicate the extent of the continental ice sheets. The grid lines are 30° of longitude and latitude apart. For the map an equal-area Hammer projection was chosen. This confirms an earlier result by the GLAMAP2000 project. As in CLIMAP, the largest cooling (-10°C) occurred in the mid-latitude North Atlantic Ocean and extended into the western Mediterranean (-6°C). But the cooling was generally larger in the eastern parts of the oceans than in the western parts. The cooling was particularly expressed along the coast of Africa, for example, in the coastal upwelling area off today's Nambia and South Africa. The tropics (between 15°S and 15°N) cooled on average by (1.7±1)°C. Generally, the cooling was larger in the Atlantic than in Pacific and Indian Oceans. There was even an 1-3°C cooling in western Pacific warm pool. The east-west temperature differences were less pronounced in the tropical Pacifc and Indian Oceans than in the tropical Atlantic Ocean. A 2-6°C cooling in the Southern Ocean indicates a northward migration of the Polar Front. In the Pacific Ocean, the subtropical gyres were possibly warmer by 1-2°C. Please see also the other papers in this Special Volume. Mix AC, Schneider R, and Bard E (2001) EPILOG – discussion and reply, IGBP Newsletter 44, 26-27.